This lamp started out as the drive bay from a computer chassis that I picked up while walking home from work one day. 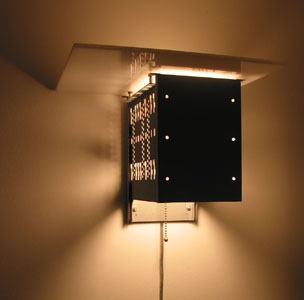 The size, proportions, perforations and mounting holes made it ideal to use as a wall sconce. Only one hole had to be drilled in to convert it into a lamp. The "shade" was made from a piece of scrap translucent plexiglass. This lamp was the topic of the first article I wrote for Readymade. Later on I realized how fortuitous the find was, because I've never been able to track down another chassis to match it.